Last month I explained why gold is not an asset to hold in every kind of market. But here’s an even more extreme piece of evidence. Gold is so far behind because it has no inherent value, it creates no product or new income, or innovation. It just sits. 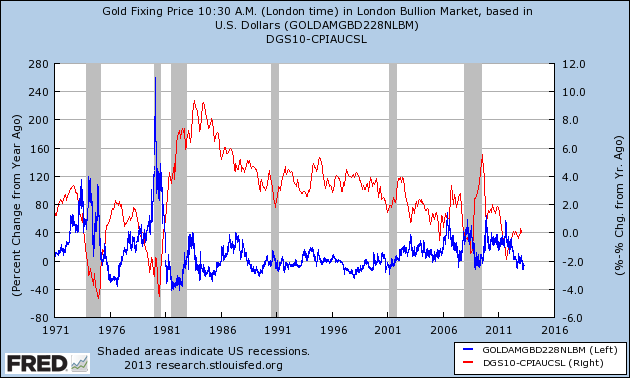 Gold is so far behind because stocks, bonds and dollars in a humungous, history-shattering bubble. We shall see which case is correct. Investors need to remember that the reasons for gold’s present strength — above all else mismanagement of the global economy and international financial system by governments and large financial corporations which has resulted in a low-growth, high unemployment, negative real rate environment — although historically abnormal, will eventually subside, and we will return to the historical norm where gold significantly under-performs paper. That’s because gold just sits, whereas other assets either produce a net return, or are a net liability. I believe that in order to restore growth, what the system needs, and what it is driving toward is restructuring. This can either be accomplished intentionally through explicit haircuts or defaults, through high inflation, through a slow painful private deleveraging process or through strong organic growth. I don’t know how debt reduction will take place. It could be three months or years away, or it could be another grinding, unemployed and depressed ten years, full of false dawns. Certainly that is what has happened to Japan since its stock market and real estate bubbles burst twenty years ago. Maybe the West will perform better than Japan in the deleveraging trap — maybe new technological innovations like cheap decentralised solar energy will provide the necessary organic growth to overcome the debt problem. Or maybe not. Until the private debt load is significantly reduced, it will act as a huge weight tying down economic growth, tying down employment, and structurally weakening both the financial system and society. High debt loads require low interest rates to sustain — which with a little inflation means negative real interest rates. Gold has traditionally done very well in low real rate environments. Once the deleveraging trap has been left behind, it will be the time to ditch gold and plough all of that purchasing power into productive assets: industrial stocks, real estate, farm land, inventory, and labour force. 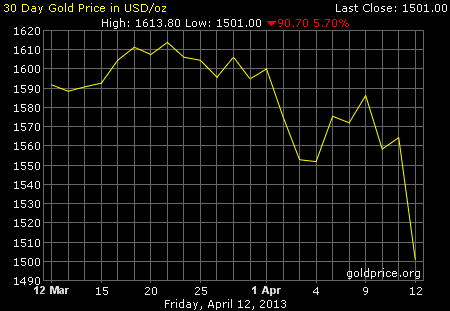 And gold will once again settle into significantly under-performing stocks.